Hi True Preppers, this is FJ Bruiser from TruePrepper with a post about my favorite prepper lighter. I’ll look at several kinds of lighters and explain why one specific type and model is my favorite. First of all, this involves FIRE, and anything involving FIRE is inherently dangerous. That’s why the packaging of all the items I discuss says things like “Warning” and “Danger” and “Caution”. Pretty much every word I can think of to describe something that can hurt you. So be careful! 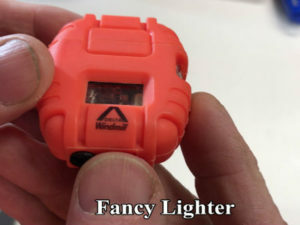 I mention a modification to my favorite lighter that is possible (and works for me), but I do not endorse or recommend it since it could possibly be dangerous. So you are duly warned and if you do hurt yourself, property, or others, you can’t blame me. 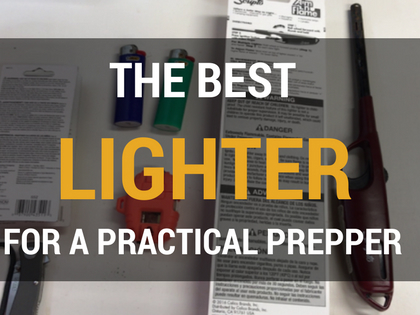 What makes the best prepper lighter? I’ve owned many lighters and learned what is good and bad about them all. I need a good prepper lighter to perform in an emergency to start a campfire and also in daily use to melt the ends of paracord. Before describing my favorite, I will show others I considered and why they won’t work for me. 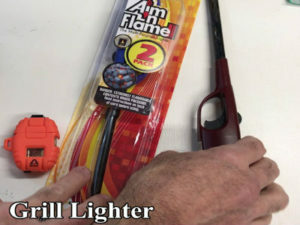 This is not a review, but a simple comparison and recommendation.Note that I am excluded any lighter that uses lighter fluid and/or flint because those lighters don’t store well and can easily dry up or leak. All the lighters I considered use butane. I call these “Bic” or cigarette lighters. They cost less than $1 a piece, are not refillable, and are frankly hard to operate. They often don’t light the first try and you can hurt your thumb trying to make them work. If you hold it down for just a short time, the while metal assembly gets hot and can burn your thumb. This lighter fails for me on 3 of 4 criteria. Out of here! These cost about $5 (2 for $11.50) here on Amazon. They are not refillable and become less reliable over time. They do usually have a view port to show how much fuel is left, but what does that matter if it stops working before it is empty (which usually happens). 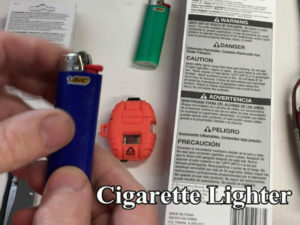 This lighter also fails on 3 of 4 criteria, but it still has value for one singular purpose…to light a grill! Not the best prepper lighter. Out of here! The Cadillac of torch lighters are well-made, reliable, wind-proof, refillable, and I believe awesome in every way. Except one. Price! The Delta Windmill I own is most excellent and costs a whopping $29 ($39 here on Amazon). If you have the cash and you greatly value the view port and wind-proof features, go for it. It misses my top choice only based on that high cost. 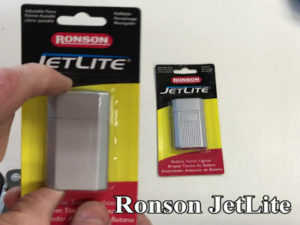 The Ronson JetLite: the best prepper lighter! I’ve carried every day in my pocket for years, it have NEVER not started the first try, works perfectly to melt paracord, and would be perfect to use in an emergency. Now just get one yourself! Check out my video below and let me know what you think.